Explore the stunning range of timeless children's necklaces and pendants by Bish Bosh Becca. Unique, personalised girl's necklaces, a gift she'll never forget. Our children's necklaces can be on an adjustable chain, so she can wear it as she grows. Childrens Necklaces There are 36 products. A gorgeous faceted crystal pendant necklace with a sterling silver snowflake charm. 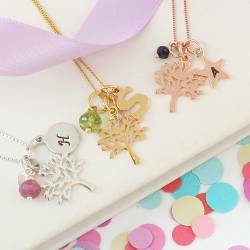 Add an initial charm to create the perfect Christmas present for a little girl or gift for a winter wedding. A pretty faceted crystal pendant necklace with a sterling silver star charm. Add an initial charm to create the perfect present for Christmas or because she is a little star. A lush little white heart shaped freshwater pearl glistens with delicate iridescent as it hangs from a delicate sterling silver link chain. A modern pearl necklace for a little girl. This childs personalised sterling silver charm necklace has her initial,stamped onto a silver disc and a birthstone crystal. It is all about pretty, dainty gifts with a special personal touch. 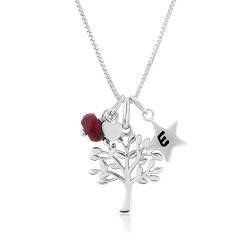 This childs personalised sterling silver charm necklace has your chosen initial, stamped onto a silver heart and birthstone crystal. It is all about pretty, dainty gifts with a special personal touch. A childs personalised sterling silver charm necklace with a letter on tag charm with cut out heart and a birthstone crystal. A pretty dainty gift for a little girl with a special personal touch. This childs personalised pearl and silver charm necklace has her initial, stamped onto a silver disc. This gorgeous collection is all about pretty, dainty gifts with a special personal touch. A childs personalised sterling silver charm necklace with an initial and a swarovski crystal and white pearl. This gorgeous collection is all about pretty, dainty gifts with a special personal touch. Childs Personalised Sterling Silver Star and Pearl Necklace. This personalised pearl and silver charm necklace has your chosen initial, hand stamped onto a silver star. This gorgeous collection is all about pretty, dainty gifts with a special personal touch. Timeless white pearls are given a modern twist with a little Mother of pearl flower and small garnet beads to create a dream necklace for a little girl. Just perfect for her first pearl necklace. 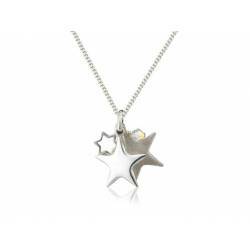 Three sterling stars with a swarovski crystal creates this pretty little childs star necklace.Just to tell her she is a little star! A delicate single pearl with a sterling silver rose gold or gold heart, the perfect necklace for a little girl. A pearl pendant she will treasure forever. This stunning childs necklace has a sterling silver heart with fabulous white freshwater pearls. The perfect gift for that occasion when only an extra special present will do! 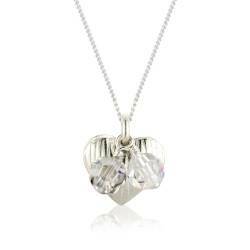 A delicate striped silver heart with sparkly iridescent swarovski crystals. This mini childs silver heart charm necklace is made to match the adults Valentine necklace.